Well, that was really cool. We just had the session where the original cast of Please Be Seated, met with the new cast who’ve been working on the new version. Each group had either invented or explored the jungle of ideas in this text in very different ways, and now was meeting for the very first time. 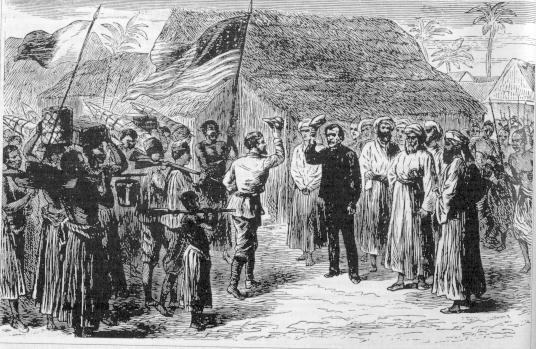 Stanley’s famous 1869 greeting “Dr Livingstone, I presume?” has a less famous response from the long-lost explorer: “Yes, and I feel thankful that I am here to welcome you.” And we were. There was, as, they say, a lot of love in the room. And trepidation, as it turned out. ...you've been down the back of the couch this whole time? On this, the last of the Wednesday afternoon sessions, we gathered around a significantly larger group of tables, though still sitting in separate groups. After a round of introductions and cordial chat, the reading began. I sat beside a knot of three of the original cast, and reflected that I felt some level of worry about how this new script was going to go down with the original cast. I’ve made a transition from Facilitator of group devising process to a Playwright functioning as custodian of some VERY personal verbatim text. Even though it was all done with permission, I was aware of the intimacy and ‘freshness’ of these words. There were childhood stories from the distant past, but also some intimate stories of real relationships that were happening there and then. I was confident of my treatment of the ideas, both ethically and aesthetically, but doubts hovered. What if they didn’t like it? What if the original cast wanted to change or cut this new version? All these options were on the table, as were multiple copies of Please Be Seated: Draft 2. And so we read it. Sam S played some music possibilities at pre-arranged points. Sam W observed there was a quiet and focus in the room. 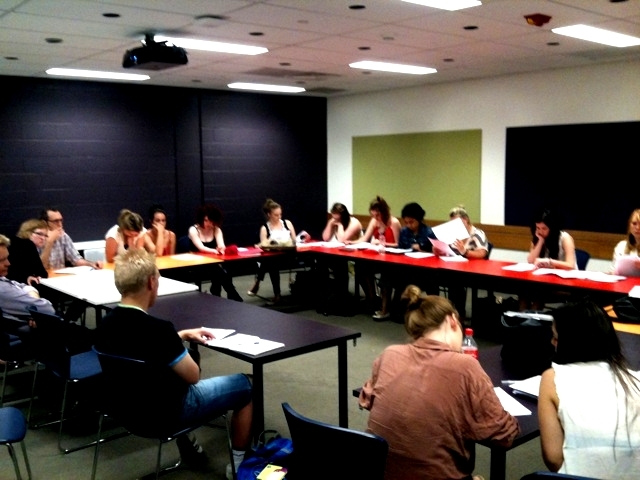 Segments of text the group had enjoyed for their comic potential last week today elicited smiles rather than laughter. There was certain tentativeness (Tentativity? Tentification?) around the text we held in our hands. My eyes wandered, and I noted others glancing around the room also. Torn between the text and the reactions it might be eliciting from others. There were moments of laughter, recognition and tears. Any initial thoughts, feelings or responses to this reading of Draft 2 of Please Be Seated? original cast: Surreal and intimate…awkward, but really really nice, all at the same time. Initially I was slightly resistant as I was attached to the original script. This quickly dissolved and I found the new script interesting. new cast: So real, so good to see the journey of love, builds a real connection between actor & script – actor with writer and audience, because it is like a confession, a truth. It has come together really nicely and has become a polished piece of work. After this reading the intimacy of the piece was highlighted. Any other highlights for you in the reading? new cast: The reactions of the previous cast members when their stories came up. Love the comedy hidden in the monologues. The fact that this is true…it actually happened..it makes it kind of special. The fact we are trusted with the others stories. It’s nice. What was it like meeting the other group? original cast : They remind me of our P2 group. They all seem to get on really well. It was so great to see that our work had been handed over to a lovely down to earth group of people. So great! It was exciting to hear our stories retold and the new cast is so respectful. I loved how they had their favourite parts and could relate. new cast: Having the original cast here was both intimidating and enlightening, made it very raw and made me want to treat it with respect. …intimidating ! But it certainly brought a ‘real’ vibe the room, there was an awareness in the space, – we were reminded these stories were alive. Intimidating. But exciting. When we read the script, for me it was important to try and stay true to the people’s stories. To say it truthfully and not try to twist words or anything like that. Good. I liked watching their reactions, made the text more alive. At first I think people were worried that we wouldn’t do their dialogue justice but they loved it in the end which was splendid. new cast: No. the original cast – some of whom had contributed to the stories – were very happy with what was happening. original cast: I think it’s fine – perhaps this is because of the contract the group [wrote and] signed at the beginning of P2. I feel like there is a lot of respect in the room. And there was. After talking, around this new work for a while, and sharing our reactions, and our reactions to our reactions, the ‘birth’ metaphors started flying around. We discussed some elements of the wonder of birth in rather too much anatomical detail which was a nice running gag, especially when such things are referred to in the script (characters relate their birth stories, and there’s a scene when a chair gives birth to a smaller chair) It was a humorous way for the two groups to part as friends, and refer to the newness of this work: and the fact that we’d all contributed to its conception, gestation and first breaths. The last push to Draft 3 involved donkey work like fixing all the typos identified during the multiple readings of the piece, and writing the ending in more detail. I went with one of the simplest of the options I’d written up, a simple theatrical gesture that utilizes the chairs and the ubiquitous, but silentMAN. It’s a gesture that points to the layers of verbatim in performance and ties up the ‘story’ such as it is, quite nicely. The new cast liked the ending, both in its rough and refined form. The original cast thought it worked, but missed the old one a bit. I like it. It works. ‘ordering’, adding interstitial sequences, adding a ‘closing scene’ and editing the verbatim text. Completing Draft 3 also involved me completing the work the cast had done during the development period on divining and designating characters. There were 12 actors, and around 50-60 chunks of verbatim monologue (and occasional dialogue) to be shared between them, serving both the storyAND the need to give everyone in the cast a fair go in terms of the spoken word, which while ‘the number of lines I have’ is a fairly primitive measure of an individual’s stage time, is an understandable desire. The group had designated 9 of the possible 12, in a process that was significantly complete, and nobody had said wasn’t working. 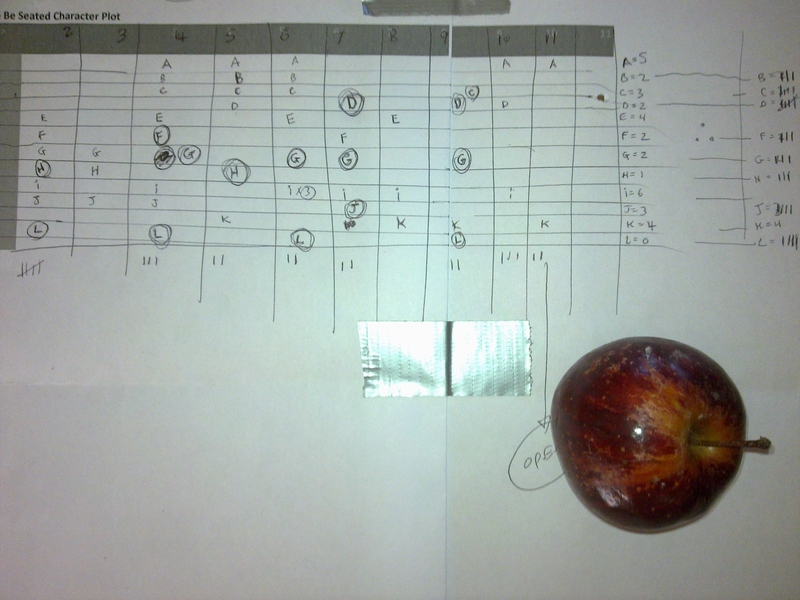 I mapped out the piece, honoring the recently deceased Steve Jobs, by utilizing an i-pencil and two bits of i-paper stuck together with i-duck-tape. Here’s a picture of this advanced playwriting technology. (The small apple indicates actual size) Jokes aside, a map like this map will probably help us a fair bit with blocking in rehearsal, once we’re on our feet. I began by looking for links and commonalities between the unassigned characters/text, as the group had done, but ended up just trying to ensure there weren’t any contradictions in material to be spoken by the one actor, and their onstage appearances and amount of text were distributed fairly evenly. Really, this is the kind of job that needs more than one mind on it, that’s why drama’s collaborative nature can be so useful. I wrote up Draft 3 for rehearsal, which contains characters ‘A’ to ‘L’ and Draft 3.1 (without character designations) for everybody else in the world. The performance text we’ve created will sustain multiple readings, so by NOT assigning characters, I’m not just trying to be arty. I’m building in this idea of character location and designation as a ‘way in’ to the work for each new cast (assuming it’s performed again) It’s little process in the product. More pragmatically it means that the work can be performed by a relatively large cast of indeterminate number, so it’s open to more groups to potentially perform in the future. Once the printer’s fixed, I need to print up enough versions for everybody, and start to plan rehearsals which start in a fortnight. This change of activity will involve a transition in principal role for me from playwright to director. I’ll update again once rehearsals are underway.